Griffin is one year old! This past year has been the happiest of all my 26 years. Griffin has filled my life full of love, joy and endless laughter. Even just thinking about him brings a genuine, heart felt smile to my face. It is challenging to find the words that my heart feels, but truly is the light of my life. Perhaps, this is the way people feel when they have a human child, one day I'll know... but, for now Griffin is my baby. Hello Victoria. Thanks for sharing with us all today! I would like to thank you so much for sharing your great story about your wonderful little German Shepherd puppy Griffin. What an great name! It's so nice for you taking the time to come here and tell us all about your German Shepherd puppy story. 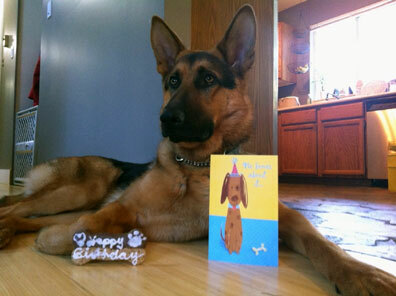 And I just love the picture - Griffin is so handsome - beautiful GSD! And he looks soooooo happy just hanging out with you all too! Chulo in Spanish means "pretty boy" and he is that!!! Griffin is one heck of a dog, and brings a smile to Billy's and Beatle's face too.